Mark Bell and his fantastic team of staff at the Hatton Arms in Cheshire, invited the team of writers from jumpsracing.co.uk down to his sports-mad pub for a Cheltenham preview evening on Wednesday 25th February, with the panel comprising of Nicky Henderson, Carl Llewellyn and Angus "Statto" Loughran. 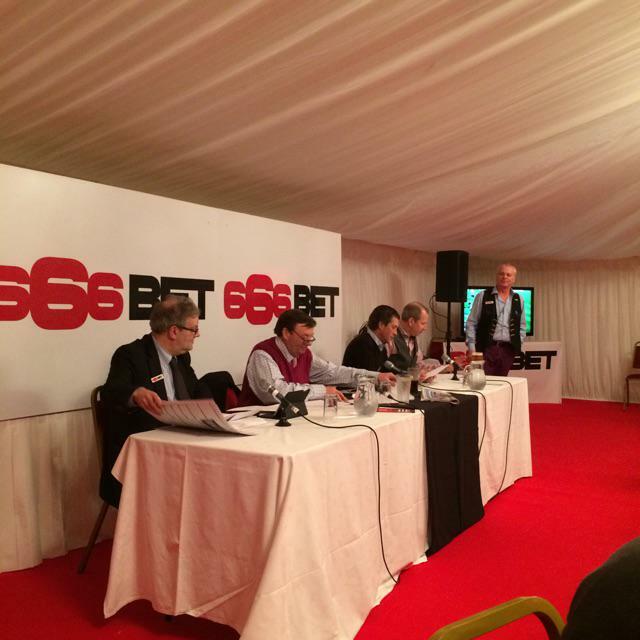 As is the case these Cheltenham preview events, the audience was hungry for tips and insights ahead of the four day meeting from those 'in the know' and here's a recap of what was discussed between the panel and audience for each day of the Festival. With Nicky Henderson in the spotlight, Supreme Novices' Hurdle talk centred around the chances of his horse, L'Ami Serge, who is unbeaten in three starts since arriving at Seven Barrows from France in the Autumn and is currently the 4/1 second favourite behind the Willie Mullins trained Douvan. Whilst Henderson had only positive things to say about his runner, he was fully aware of how highly regarded the favourite is, stating "he's supposedly the best horse Mullins has brought over to the Festival", which is certainly saying something and the overall consensus was that Douvan is going to be "hard to beat"
Final word on the Supreme: Douvan is the one to beat! It was a very similar vibe as the Arkle was being discussed with the shared opinion being that Un De Sceaux sets a very high standard and would "blitz" his rivals from the front. As far as 12/1 chance, Josses Hill, trained by Henderson, is concerned, stable jockey, Barry Geraghty, is happy to keep the seven-year-old at two miles and he believes he's capable of taking on the favourite. Final word on the Arkle: Expect Un De Sceuax to justify the hype. As far as the Champion Hurdle was concerned, it was very much about whether Willie Mullins can complete the quick-fire hat-trick with Faugheen, a result that would definitely see the punters take an early lead in their battle with the bookies. Carl Llewellyn totally dismissed the chances of Hurricane Fly, statting that Ruby Walsh will ride Faugheen and the two-time Grand National winning jockey wasn't keen on the New One, either. He did say however that he liked Arctic Fire's chances each-way at odds as big as 16/1 with Ladbrokes and punters shouldn't dismiss reigning champion, Jezki, especially on good ground. Final word on the Champion Hurdle: There's plenty to like about Faugheen but there remains value in the market amongst the bigger priced runners. In the Mares Hurdle, there wasn't a massive amount of confidence behind Annie Power, with suggestions that all is not right with the mare. Polly Peachum is the Henderson representative in the race and at 10/1, he is hopeful of a decent run. Henderson was also sweet on the chances of Cocktails at Dawn in the Novices' Handicap Chase, which is the final race of day one. the seven-year-old hasn't won over fences yet but the former champion trainer has seen enough to think his runner has a decent chance on good ground. He can be backed at 25/1 with Skybet or Betfred. As you would expect, all the talk about day two revolved around what looks set to be the race of the meeting, the Queen Mother Champion Chase, and with Nicky Henderson at the plate, he was naturally probed about the wellbeing of 2013 winner, Sprinter Sacre. Henderson made no attempt to hide the fact that 'Sprinter' was "as good as ever" two years ago but is "is now beatable." He went on to add that "(at) 90% of what he was in 2013, would be enough" for Sprinter Sacre to regain his Champion Chase crown. The entire panel agreed that both Se De Grugy and Champagne Fever deserve huge respect and are both worthy of their place at the head of the betting and it would be no surprise if any of the trio emerged victorious. Final word on the QMCC: We weren't sold that Sprinter Sacre was a) 100% or b) as good as he was and as such, it may be worth taking him on and given there wasn't a bad word said about Sire De Grugy, the Gary Moore runner could well be the first back-to-back winner of the race since Master Minded in 2009. Elsewhere on Wednesday, Carl Llewellyn was bullish about Any Currency's chances in the Cross Country Chase, with the Martin Keighley trained runner currently a best price 6/1 with Ladrbokes. Whilst in the Bumper, Nicky Henderson was non-committal about whether any of his three entries would run, stating "it's a tough race for young horses." Llewellyn's two picks for the final race of the day were Supasundae (14/1) and Moon Racer (12/1). Coneygree was a horse that everyone liked and Henderson even went as far as to say that the Mark Bradstock runner "would smash his rivals" in the RSA Chase, adding that Nico de Boinville, who has ridden Coneygree to two victories already this season, and also rides for Seven Barrows, is very confident of the eight-year-old's chances. However, he's not certain to run in Wednesday's race and the Gold Cup is also a target. Final word in the RSA Chase: If Coneygree runs, get on! The World Hurdle is the race of the day on the Thursday and it was agreed that the three mile contest is wide-open with a host of runners boasting solid claims. Whisper, who runs for Nicky Henderson, "would have loved another three weeks and Aintree would be prefered" but there's still a chance he could line-up in the former Stayers Hurdle. Overall though, this was a race that failed to see any member of the panel nail their colours to the mast but Henderson does like Rock on Ruby. Further inspection reveals that Harry Fry's runner who has four wins, two seconds and a third from eight runs over hurdles at Prestbury Park! The 8/1 with Paddy Power could therefore prove to be a solid each-way bet. Final word on the World Hurdle: A wide open race in which nobody wanted to make a firm selection. Ma Filleule represents Nicky Henderson in the Ryanair Chase in Simon Munir's recognisable green silks, and he said "the best mare in training over fences, currently" has a "great chance." She is currently 6/1 with most firms. The Pertemps Final was touched upon briefly and the one to note here is the Tony Martin trained Edeymi. The Irish Raider hasn't won over hurdles since 2012 but it would be no surprise if he was well handicapped, especially given the manner of his recent outing at Musselburgh, which promoted a stewards enquiry when finishing fourth, ridden only 'hands and heels', promoting one pundit to refer to the trip to Scotland from the Emerald Isle as "a day out." Edeymi is a best price 14/1 with Ladbrokes but as short as 10/1 and we can only pass on the word. According to Nicky Henderson, 2013 Gold Cup winner, Bobs Worth, is still "very much alive" and despite a poor run on his only start this season in the Lexus Chase at Leopardstown, believes he still holds claims if the ground is good on the day of the Cheltenham Gold Cup. Angus Loughran is a big fan of Many Clouds in this race and Barry Geraghty is sweet on Djakadam, according to Henderson. However, all agreed it was a tough race to call. Final word on the Gold Cup: Silvinaco Conti s the worthy favourite but there are several boasting claims. Nicky Henderson was delighted with his three runners (Hargam, Peace and Co and Top Notch) in the Triumph Hurdle, but doesn't know which of the trio is best. There was confident words for Beltor too in Friday's opener but Henderson "would be disappointed " if he didn't win this. Henderson's concluding words about his cances on the final day of the 2015 Festival were that Out Sam is "certainly worth thinking about" in the Albert Bartlett and is currently rated a 20/1 chance. Overall, this was a great evening in a great venue, with some very insighful information that will hopefully result in a positive return on investment two weeks from now!